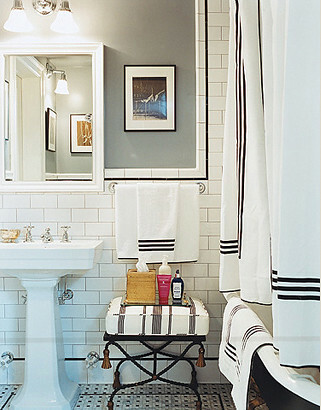 Just saw this gorgeous bathroom after reading about the designer, David Cafiero, on Lonny Blog. I've been wanting to add some masculine touches to the guest bathroom upstairs for some time now but haven't had a chance to yet since it's not exactly at the top of the priority list, but seeing this photo gets me revved to start on it. I've gotta say this is exactly what I have in mind. Simple, with clean lines, and just so darn polished. And all you need are a few pops of color to help break up the white and black color scheme. The reason behind wanting to update the guest bathroom to be slightly more masculine is that the whole house seems to be going towards the feminine route and it would be nice to break it up with some masculinity, ya know? Plus, I'm sure my husband would appreciate it since I tend to lean towards the feminine rather than the masculine.